Don't take this page too seriously!!! CONSPIRACY OF THE MASONS UNVEILED!!! During the preparations of the recent burial of Pope John Paul II, a curious event occurred: In the debris excavated in the crypt of the St Peter, to recieve his coffin, a strange object surfaced: a collection of drawings and art-objects, wrapped in felt, held together by rope made of human hair. Only one person was present at the moment, and recognising the possible scandal, spiritid it out, hidden under her/his ceremonial robe. In more private circumstances (hard to find these days in Rome! ), the packet was opened, and the Finder realised immediately the dangers of revealing these works of art to the world. Not knowing what to do, he/she kept it strapped to her/his body for the next few days. During the funeral service outside on st-Peters square, it was still there, hidden. In the height of the service, when the coffin was turned once more to face the world, before entering the cathedral for the last time, the carrier of this packet fainted under the added weight and exasperation, and the sheer terror of responsability. A friendly bystander, who happened to be related to the sister of the hair-dresser of the neighbour of a clerk who had just signed the building-permit of the niece of a swedish cook, who had friendly relations with a lady black-smith from Iceland, who worked with an Italian teacher who also did restorarations for the Amsterdam Rijksmuseum who shared a workshop (in a squatted building in Amsterdam) with assorted other artists, carried the Finder out of the mass of human sorrow on St-peters square. 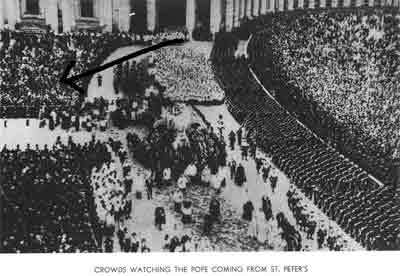 Now this person was there, present on St-Peters square, with intentions quite different from all the other half-a million. In his perverted mind, the highest pleasure was to be achieved right there, in this moment of mass-hystreria. Looking around for a possible victim, he found his chance right there, when the Finder, standing next to him, fainted. Carrying the Finder to a sleazy hotel around the corner, he tried to take advantage of the fainted state of the Finder, once in private quarters, but immediately stumbeled upon the packet hidden under the ceremonial dress. What happened after that with the packet is unclear, Details of the doings of the sister of the hair-dresser of the neighbour of a clerk who had just signed the building-permit of the niece of a swedish cook, who had friendly relations with a lady black-smith from Iceland, who worked with an Italian teacher who also did restorarations for the Amsterdam Rijksmuseum who shared a workshop (in a squatted building in Amsterdam) with assorted other artists will follow maybe later, but it ended up right here in front of ME. As I write this, I am looking at the most unbelievable collection of Original artworks, undoubtedly genuine, actually more genuine than the fraudulent copies so well known to the world. It is an overwhelming proof of a CONSPIRACY! The CONSPIRACY of the SQUARE! The CONSPIRACY of the MASONS! I can conclude from all this only one point: There is a CONSPIRACY to prevent the general public to know about Ger/yurt, and of the freedom of living in the round. In all the WORKS OF ART now discoverd, a reference can be seen to Ger/Yurt, or to living in the round in General. Now is the time for all to see with there own eyes what the ORIGINAL artworks looked like! THE POPE IS DEAD, LONG LIVE THE POPE!!! 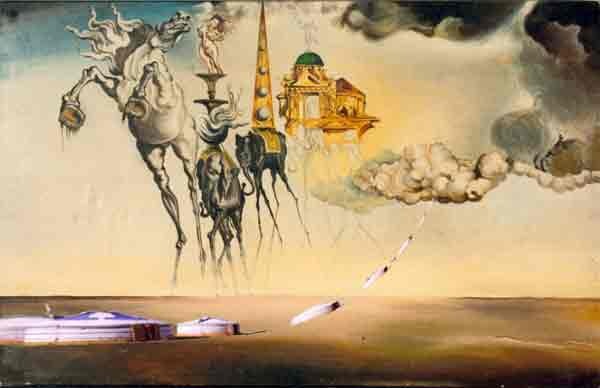 Salvador Dali may have been a weirdo, but he was no cheat! 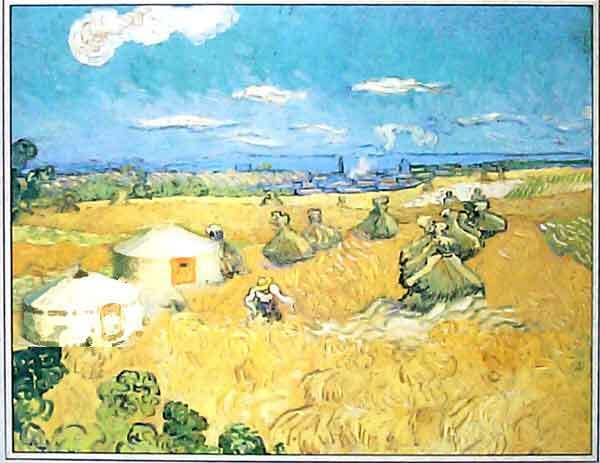 Van Gogh early works were painted in the south of Holland, in a poor region of simple people This early phtograph (1922!) 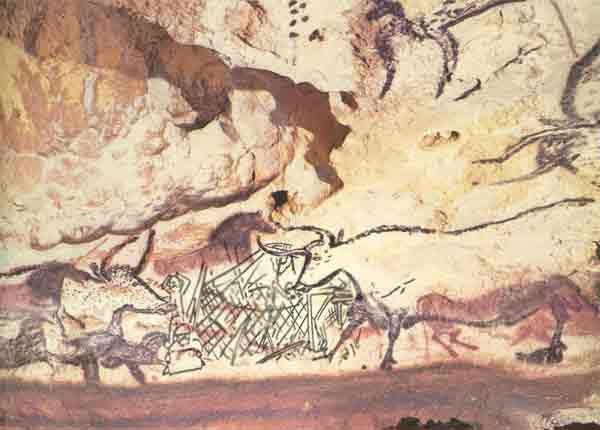 shows what the original cave-drawings looked like! After moving to France, Van Gogh kept up painting what he saw! Little Country-folk dipping their forks in one communal bowl of Mutton-stew. The fraude of this painting shows them sitting in a BARN, but NOMADS HAVE NO BARN!!! Even the concept of building some kind of shelter for the animals off which they live is TOTALLY ALIEN to them. 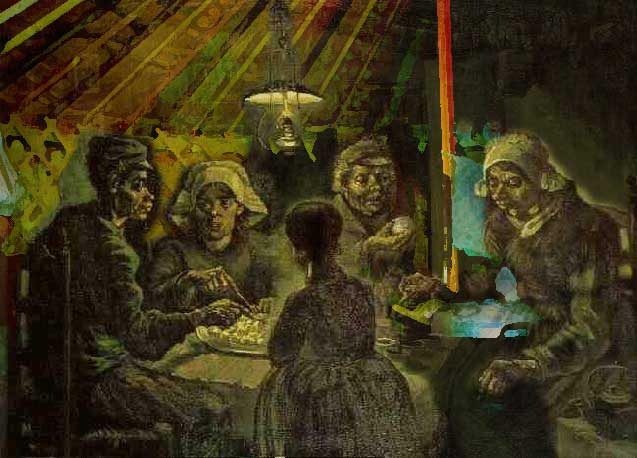 This is the earliest proof of Van Gogh trying to tell the Yurt-secret, and upon completion was immediately confiscated for 'correction' by THE CONSPIRACY. Obviously the cave was used as a refuge by a group of ger-dwelling Herdsmen, who painted their most horrific nightmare on the bare rock! Cattle herding (and thus GER-dwelling) preceeds cave-dwelling!!! A new term has been coined to specify this prehistoric era: GEROLITHIC. Later in his short-lived career Van Gogh tried again, as this glorious field of Barly shows, to show all kinds of Ger in the lanscape. These are more sedentary farmers who have, by force of THE CONSPIRACY and taxation, left the herding of animals, and gone to crop-raising. Leonardo da Vinci studied all themes in art and science alike. Strange enough no reference was ever found in his work to the (then wellknown) science of GER. 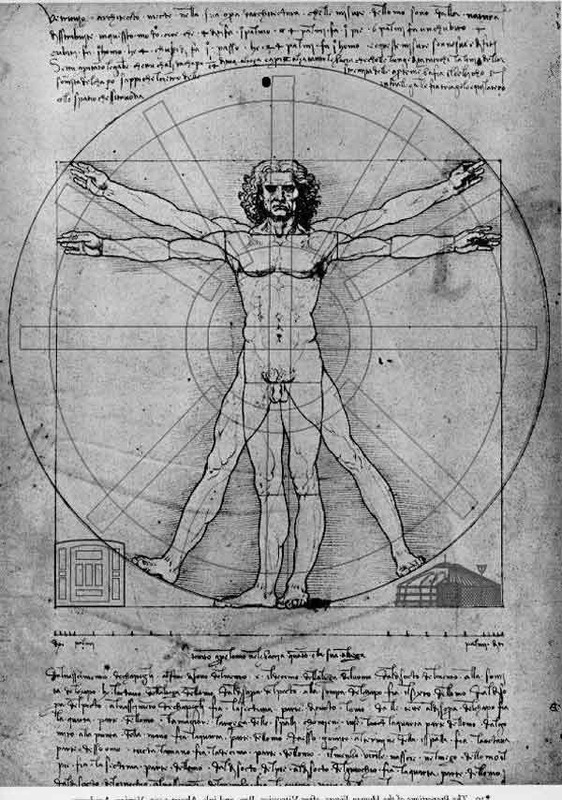 Now we finally know that he DID study the Ger, in particular the relation of the HUMAN BODY to the size of Gr, and the GOLDEN RULE. If you want to know more about this conspiracy, email me. Or if you would like better-res pictures, email, and I will maybe send you one..
And if you also know about this conspiracy, and have something to contribute, email me too!! 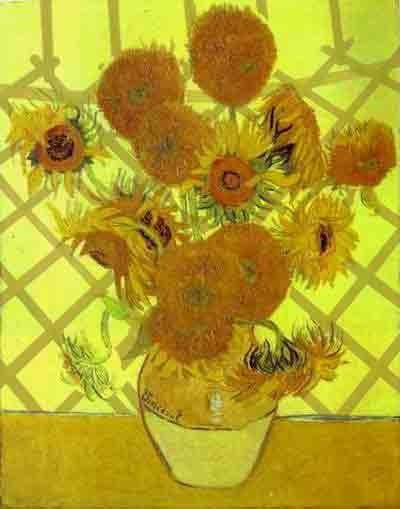 After completing his last assault on THE CONSPIRACY, Van Gogh hid this painting in the cleavage of his then-favorite lady-of-disputable-reputation, and ran for it. As we all know, the very same day he met his doom, by the hands of an assasin, sent by THE CONSPIRACY, in order to retrieve the newest threat to THE SECRET. A noble fighter he was, and it is with due respect that I now finally publish what the world had to see 120 years ago! There are two versions of this painting (by GOYA) known, the DRESSED and the NAKED MAJA. There has allways been a lot of secrecy involving the naked version, because the lady in de picture was said to share her couch with kings AND painters/artistas... At the time he painted these, Goya was employed as the Royal-Painter by the King Himself. The DRESSED version got to hang in the Salon of the Palacio-Royal, the NAKED version in the Royal Bedrooms (or so goes the story...).